“ TEN –No, it is that bad! Misfortune, ruin, defeat, loss, failure, pain, desolation beyond tears. Alternatively, evils or misfortunes which are over. We determine the meaning of this paradoxical card by exploring the context in which it appears. In terms of world events, we’ve got “A Tale of Two Cities” playing out all over the place: “It was the best of times, it was the worst of times …”. We’ve also got enormous amounts of Cognitive Dissonance plaguing a species — especially in the US — who has mostly lost the ability to discern anything beyond the projected screen. Even the rare people who see beyond one or two screens usually stop there, patting themselves on the back for their intelligence and insight. For some bizarre reason, it doesn’t occur to people who’ve busted through one reality that the “opposite” they’ve embraced may be exactly the same in a mirror image, or even more restrictive and insidious. Once people burst through a reality, instead of having the presence of screens confirmed, they simply assume that the screens they’ve seen beyond are the only two screens in existence. No amount of pointing out screens and projectors/projections seems to convince them that they’ve only just begun the journey. I write a lot about the Middle Way, a path that recognizes good within bad, light within dark, positive within negative, because the temptation to label things black and white traps so many people into the same old, same old with a different mask. People see a good side of someone they want to believe in and use that photograph or speech as “proof” that all their detractors have zero merit; this is the new sacrificial lamb so s/he must be telling the truth; no animal or baby would respond to an “evil” person this way; look, so and so loves his children, ergo, he must be on our side. Any information to the contrary — especially if it comes from a news outlet or government people have been told lies (hint: they all do at some point) — is met with Cognitive Dissonance. It does not compute, because these conflicting “facts” can’t possibly go together. Oh, no? How many of you have ever dated a narcissist or psychopath? How many of you have simply had some bad luck in love in which you can’t really say the person was crazy, but he or she did break your heart with false promises s/he failed to deliver? If that person had zero attractive qualities and no love in their heart, then why did you ever fall in love with them in the first place? You might wonder in retrospect, but at the time, you saw the good without the bad. Or, maybe you saw the good and the bad, but chose to ignore your Spidey Senses, because you really, really wanted to believe the good. Guess what? 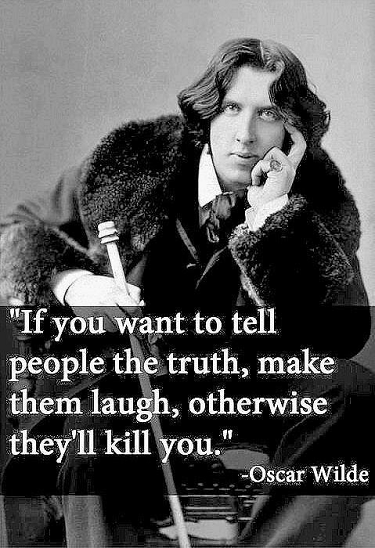 That happens on the political stage, as well. People fall in love with the leaders projected on various screens, just as much as they fall in love with characters in romantic comedies or television shows. Projections don’t equal off screen or behind the scenes reality. We live in a world with layers and layers of obfuscation, projection, and Glamour (as in the magickal term for creating a false, glittering “reality”). We live in a genetically and socially engineered world that does everything in its power to keep people so busy, so distracted, so ashamed, so poisoned, narcissistic, addicted and befuddled that they will never move beyond the first few screens. Inbred narcissism, moral relativism (intentional confusion of one’s inner compass) and one-dimensional or at most two-dimensional awareness ensures that even those who move beyond those first few screens will be marginalized, attacked by those who worship the State, religion or status-quo, and/or deemed insane. Because the programming runs so deep, if people notice an “alternative” news source or politician getting “persecuted” or “maligned,” they automatically accept this as “proof” that this “alternative” really is “different,” not even realizing how thoroughly costumed, cast and plotted this mini series is. Many of the characters don’t even realize they’re actors, which allows them to project “sincerity” even if they’re playing a role. In a world of Reality TV, Facebook, Twitter, and online avatars, few people would recognize reality if it slapped them in the face. And it does. Those creating the dystopia on this planet need our consent to continue. We live in a Free Will Universe. The reason it doesn’t feel that way is because those running the projections operate according to the letter of that law rather than the spirit of the law. They manufacture consent by controlling not just the mainstream media, but also the education systems, the medical system, and religions, infiltrating the “opposites” of these, as well. As Vladimir Lenin said, “The best way to control the opposition is to lead it ourselves.” Self proclaimed “awakened” people assume that because they see through one layer of reality and find some good qualities in the opposite of that reality, that they have now seen “the new solution” or “the real truth,” but they’re really just trying to find something, someone, anything, anyone who will take away their personal power again. Personal power’s like a hot potato. It requires responsibility for choices, and few people feel comfortable accepting that responsibility moment by moment for the rest of eternity. They’d rather make one more choice — the “right choice” — and outsource the tedious process of discernment, choosing and responsibility. …this desire to worship a guru instead of have them as more of a teacher and activator runs very strong with so many people. It’s really not that different from any pedestal situation — almost like our culture has a combo of collective borderline and narcissistic personality disorders. To not have those disorders (and the borderline IS that whole no boundaries, merging, I don’t know where you end or I begin paradigm) makes you a freak in their eyes. Or a stick in the mud. Or just … out of place. Fortunately, more and more people are stepping out of that whole “take my power, please take my power, ohhh, my power’s too heavy for me, please take it from me, along with all responsibility for my choices and my energy, ahhh, we’re all one, now!” vibe that at least some people truly are looking for and capable of having a real relationship. 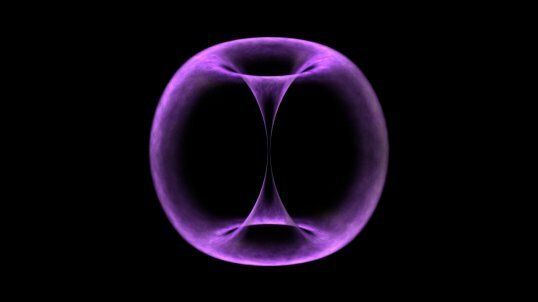 When you find one of those, you will just relax into the relationship and that oneness will happen in a healthy way … where you blend but also maintain individuation. 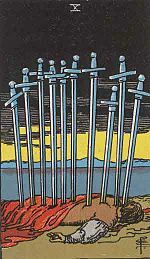 So what does all this have to do with the Ten of Swords? Me: Well, if it’s not obvious yet, then I don’t know when people are going to get it. As you said, AR-15’s to USDA, plus IRS, Social Security Administration, etc. Wide open border. Fast and Furious gun smuggling. Disarming border patrol. Disarming all registered gun holders, but not checking the gangs coming across the border. Amnesty for everyone, including the tens of thousands of convicted rapists and murderers they released from jail. Top 5 Islamic terrorists who’ve vocalized a desire to destroy the US traded for a traitor soldier who converted to Islam and possibly committed to Jihad. Sending our police departments for training in Israel “we will destroy Gaza” and “it’s OK to murder non-Jews.” Hundreds of generals discharged. Vets labeled with PTSD so they can’t hold guns. The Muslim Brotherhood are not considered terrorists anymore, but the Founding Fathers, people who organic garden, believe in the Constitution, and want to make the world a better place are…. Seriously, do we need blood in the streets for people to get it? Or even then will they think it’s something else? The cognitive dissonance in this country is deafening. At least you can’t confiscate magick. Pesky thing, those skills. My Friend: well researched, btw, this is by far the most senior commander’s ever to be sacked in US history, it’s not even close. On that note, Ken outdid himself, pull up a chair as I believe this is his longest post ever on how the illuminati picked, then systematically groomed China to be the driver in a NWO takeover, got a say, fascinating reading, good ol Rockefeller and Kissinger, kissing luciferain cousins! Besides us putting the brakes on the BRICS takeover, there is one wild card that can and will derail this plan, civil unrest in China, it’s already happening and simmering into a potential powderkeg, sooooo, why is Obama in China on Veterans day? hmmmm, http://www.whitehouse.gov/schedule/president, the NY Times front page article was how there Chinese leader’s are reverting back to their 60-80’s the US is evil with the populace, trying to whip them into patriotic fervor, always the go to way to subvert internal unrest. Seriously, what does this have to do with the Ten of Swords? Here’s the good news: remember that Law of Free Will? Well, it does come with the annoying need to accept responsibility for our creations, but it also frees us to reject creations we do not want. Permission DENIED. But Nature abhors a vacuum, so denial will only get you so far. We live in an endlessly creative universe. In order to claim that second meaning of the Ten of Swords (“Alternatively, evils and misfortunes which are over”), we need to fill that vacuum with the new, preferred paradigm. And that takes work. Here in America, we’ve been taught for at least three generations that hard work isn’t necessary, wise or evolved. Get rich quick. Play the markets. Work the system. Only, just as with those projector screens mentioned earlier, people stop once they see through on or two systems. “The Secret” did not reveal all the secrets. It garbled and diluted them for mass consumption. Manifestation can occur through working systems of reality, but that process requires discipline, discernment and yes, occasionally showing up in the 3D implementation of your vision. I can use our yard as an example. Despite what a friend tried to tell me last spring while I was weed whacking dandelions gone to puffballs with exponential abandon, “No, it really is that bad.” This yard, when we took it, made me cry. Yes, I saw the potential, and yes, I have spent hours per day figuring out how to create beauty, abundance and fertility in an otherwise destroyed, hideously ugly, forgotten and disharmonious place. But … and here’s the key part: I have also personally hauled over 20,000 pounds of wood mulch, thousands of pounds of compost, volcanic ash, used coffee grounds and rock dust. I’ve invested my own time, money and energy in seeds, trees, used my own diluted urine as a foliar spray when plants were dying from not enough nitrogen, moved plants, sourced plants, weed whacked, hauled concrete, artistically arranged plant groupings, and created wildlife habitats. Yes, I had a vision and help from faeries with whom I took the time to communicate, but I also implemented that vision. We face formidable challenges in America today and around the world: food insecurity; the poisoning of fresh and ocean water; air pollution; radiation; geo-engineered climate change and droughts; uncontrollable (out of human hands) climate change, volcanoes and floods; over consumption and growing landfills; Satanic ritual abuse and the practically normalized sexualization and abuse of children; a dumbed down population; huge swaths of people completely dependent on the State for food, subsidies and healthcare; weaponized vaccines; leaking nuclear reactors; globalist Kool-Aid drinkers unwittingly ushering others into their own slavery and suicide; actual laws on the books that permit slavery in the US, Ukraine and Greece; banks and a BigPharmafia completely protected from prosecution; corporations with more “personhood” than actual people; a public so brainwashed and overwhelmed by information, EMF’s and technology that they really don’t know if they’re coming or going, and if you try to tell them, they’ll ignore you, ridicule you, attack you or stare at you like you have four heads. There’s more, but I’ll stop now. 1) Recognize the problems for what they are. You don’t need to get stuck here, but you won’t know how to address issues without falling into new traps if you adamantly refuse to see the layers of issues. You can choose one or two areas as your focus, but be honest with yourself. Pray for courage and clarity. 2) Remove consent. Literally express the fact in writing, aloud or in some other clearly definitive way that you do not consent to these plans and orchestrated problems. Nor do you consent to the “solutions” engineered for your “reaction.” If, instead of the predicted “reaction” to the “problems,” you simply remove your consent to both the preordained problem and solution, then you step onto your own path. 3) Do what is yours to do. Follow through on your vision, hopes and dreams of an alternative reality. Use whatever skills, tools, passion and calling you feel in whatever ways you can. You don’t need to become a politician, natural healer or organic farmer, but if you feel called in those directions, then start walking. If you feel called to start small, then start small. But start. I’ve decided to extend one of the September Specials through October 31, 2013. Given that Samhain/Halloween/All Hallow’s Eve marks the thinnest veils between worlds, the “Timeline Tune-In and Tune-Up” Special makes sense to continue as preparation for easier shifts among dimensions and timelines. As usual, this months’ specials arose from some kind of inner nudge of what’s needed by the most people this month. I never know exactly what they are until the moment I post. The Medical Intuitive Special is a good offer that has helped many, but it’s not specifically linked to October’s energies. As a result, you’ll have more time to sign up for the Timeline Special, but today is the last day to sign up for the Medical Intuitive three-pack. This reading gives you a heads up regarding the types of feelings, thoughts and experiences to watch for if you’re looking to sidestep onto a more positive timeline without needing to slog through linear time to get your desired life. In some cases, the preferred outcome even requires a sidestep, because the laws of cause and effect already set in motion on the current timeline are barreling you toward their “inevitable” end result. Fortunately, linear time’s not all it’s cracked up to be! These “timeline hops,” “portal points,” “reality jumps” — whatever you want to call them — are not only possible but powerful, and with awareness and practice, you can learn to surf such opportunities, charting your own course from current to next closest to preferred realities. $144/hour if prepaid on or before 9/30/13 10/31/13. Please contact me if you’d like to sign up. A set of three (half-hour) Medical Intuitive Sessions to offer support for ongoing progress towards wellness and empowerment. I find that some people really appreciate having occasional follow-up as their health needs and energy blockages shift in the process of healing. This mini package saves $48 off the usual rate. Offer valid if prepaid on or before 9/30/13. Please contact me if you’d like to sign up. Using another analogy, Proterrian likens us to avid gamers, rather than addicts. Of course, we’re avid. We are working for the prestigious Cosmic Gaming Magazine, and we are studying this game with due diligence, because we are preparing to write our game reviews. We are currently finishing the last round of play, and we are anxious to quit playing altogether, so we can expound with reliable authority. “Life on 3D Planet Earth: A Definitive Review.” Upon seeing our reviews in print, some of us look look forward to clicking on Uninstall.